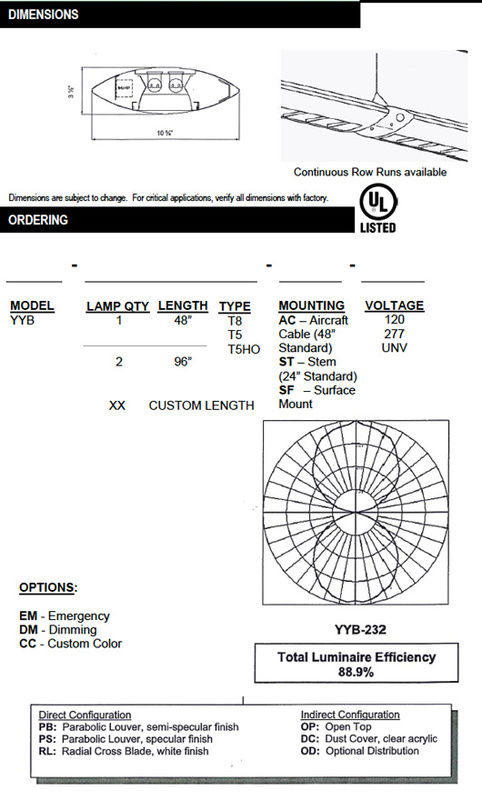 The YYB Linear Parabolic Direct/Indirect is available in 48″ and 96″ lengths. Ideal for classrooms, offices, conference rooms and reception areas. Available as direct/indirect pendant or direct surface mount. Individual or continous row mounting with cables or stems. Continuous rows achieved with contoured joiners. 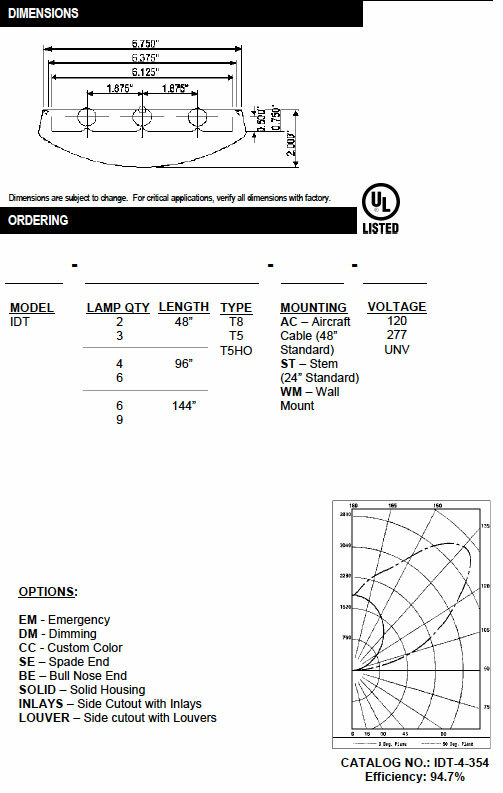 Available in one or two lamp T5 or T8 configurations. Parabolic baffle assembly constructed from matte anodized aluminum is standard. 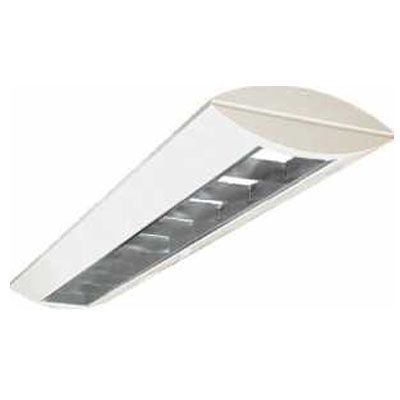 Louver features snap-in installation for easy lamp replacement. The housing is constructed of heavy gauge steel treated with anti-rust protection. Instant start electronic ballast comply with Federal energy efficiency standards. Optional electronic dimming is available. Fixture body post painted with white gloss enamel. Custom colors available. 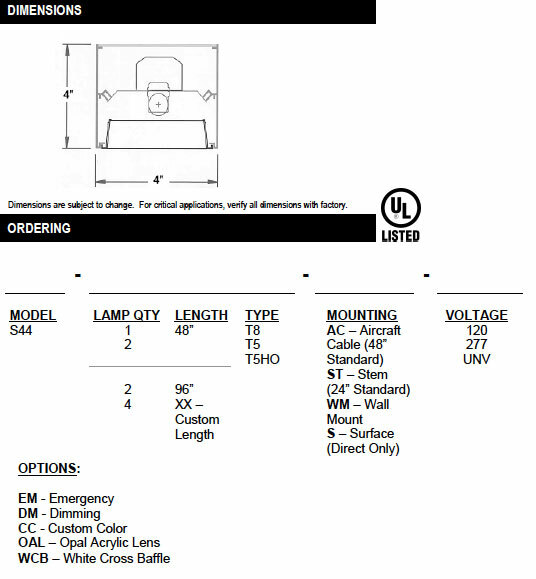 The S44 Luminaire is available in nominal lengths up to 8′-0″ sections, T5 or T8 operation. Custom lengths are available upon request. For continuous runs please call RLE for specific wiring instructions. 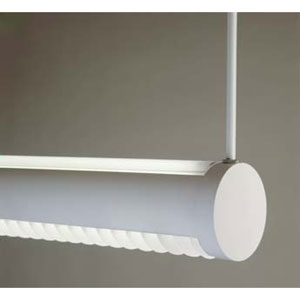 Simple, clean linear lines allow for this fixture to blend aesthetically into almost any space. Mounting can be accomplished using adjustable aircraft cables or rigid stems. Wall mount is also available. Die-formed welded 20 gauge cold rolled steel. 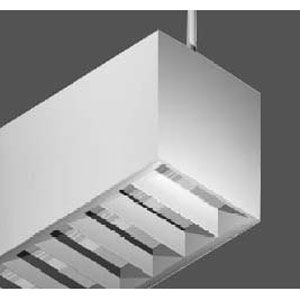 Uplight fixtures are provided with 1 row of 1/2” apertures along top of the housing, providing approximately 12% uplight. Pattern A12 acrylic lens is standard. Optional opal lens or cross blade. All parts are finished with white polyester powder coat for a minimum 89% reflectivity. Standard color is white. Other colors are available upon request. 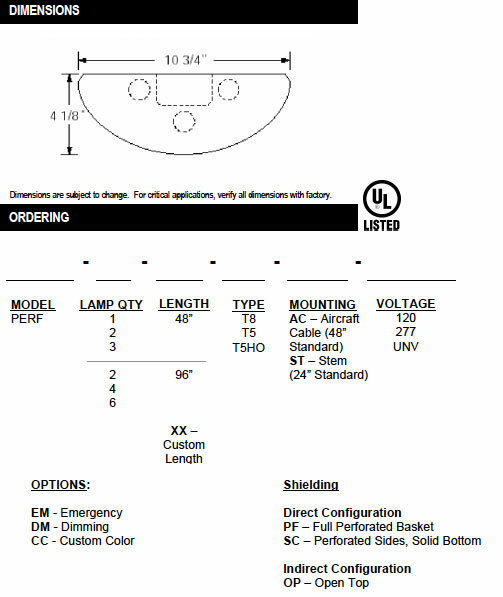 The RND Round Luminaire is available in nominal lengths up to 8’-0” sections, T5 or T8 lamping, 3.5”, 4”, 6”, 7”, and 9” diameters. This fixture is available in straight runs or square patterns. Individual fixtures are standard. For continuous row installations, row lengths must be specified. Housing constructed of durable extruded aluminum. Die-cast aluminum end plates and center couplings provided as required. Users have the choice of cross baffles and lenses. Choice of multiple lens and baffle styles available. Direct unit is standard. 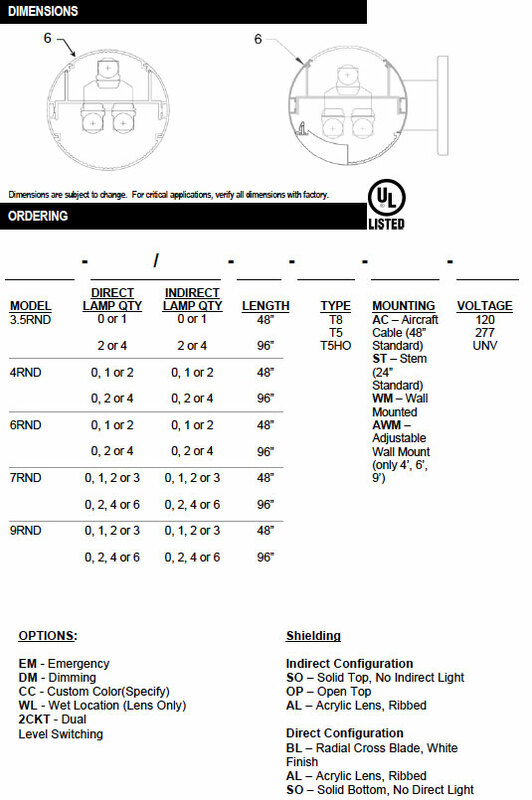 Unit is also available in direct/indirect, direct only or indirect only versions. 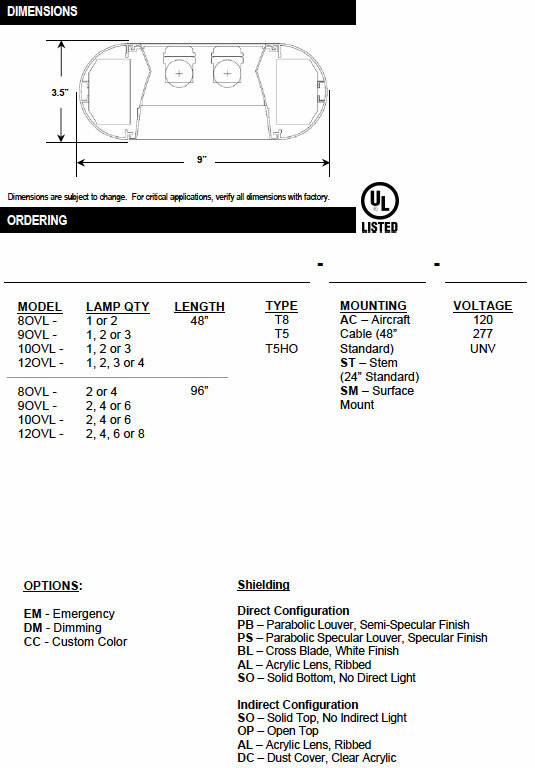 Fixture can be surface or pendant mounted using cables or stems. Companion adjustable wall mounted fixtures are also available. All housings post-painted with a smooth, white polyester powder coat. Textured finishes and other colors are available upon request. 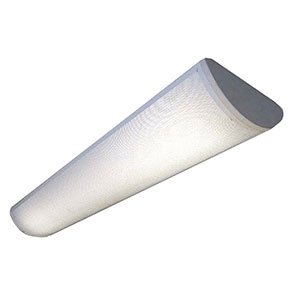 The PERF Linear Perforated Luminaire is ideal for offices, conference rooms, reception areas, classrooms and any installation where linear luminaries are preferred. 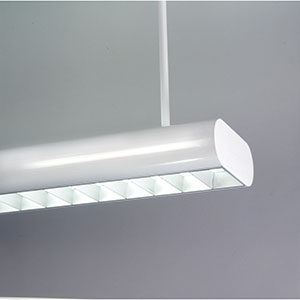 This low-profile suspended direct/indirect luminaire provides attractive, glare-free, ambient lighting. Available in 1, 2, and 3 light configurations, in T8, T5 and T5HO. Continuous rows achieved with joiner assemblies. Micro-perforated body in conjunction with opal acrylic inlay provide soft, glare-free, direct light with even ceiling illumination. Fixtures can be cable or rigid stem mounted. Available with fully-perforated basket or with optional side perforations with solid center panel. Die-formed heavy gauge cold rolled steel. End caps are molded white plastic. Micro-perforated baffle constructed of heavy-gauge steel with 5/64” diameter perforations, staggered at 7/64” intervals. Phosphate coated baked white enamel with 87% reflectivity. 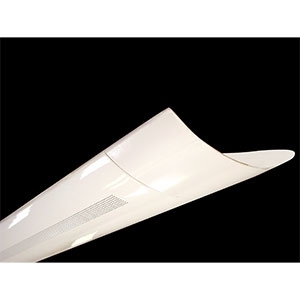 The OVL Oval Luminaire is available in 4’ or 8’ lengths, T5 or T8 lamp operation. This unit features an extruded aluminum housing with the option of either cross baffle, parabolic louver or lens. The classic design of this fixture makes it ideal for typical industrial, commercial and educational settings. Inside and outside 90 degree turns are available creating smooth transitions at corners. Cross T’s, angle connectors, end plates and center couplings are constructed of heavy gauge metal castings. Fixture can be surface or pendant mounted using cables or stems. Housing is constructed of durable extruded aluminum with cast aluminum end plates. All parts finished with white polyester with a minimum 89% reflectivity is standard. Custom colors and textures available. The IDT Linear Indirect Light is available in 48” and 96” lengths. This unit is designed specifically for use in retail applications where product representation is crucial. This fixture has light distribution that is also ideal for library stack lighting. Standard finish is white. Custom colors are available. Specially-designed housing and reflector system provide direct light to product shelving, where most needed. The housing is made of lightweight rolled formed steel for durability and modern aesthetics. Housing exterior comes standard in a white powder coat. Custom colors are available.